This is the ninth and final story in Season 2. Vicki Pallister was an orphaned teenager in the 25th Century. She had been a passenger on a spaceship that crashed on the planet Dido. 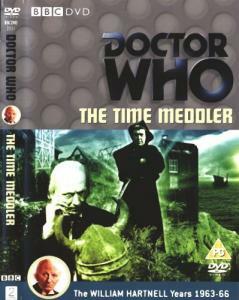 By the time she met the first Doctor in The Rescue (Classic Series, Season 2), there were only two survivors left. When the other survivor, a man called Bennett, was killed by the natives in revenge for his attack on them, the Doctor and his travelling companions Ian and Barbara offered Vicki a chance to travel with them on the TARDIS. Steven Taylor was a space pilot from an unknown time in the future. His spacecraft landed on the planet Mechanus, where a group of robots called Mechanoids held him prisoner. In The Chase, he escaped when the Doctor, Ian, Barbara, and Vicki visited the planet whilst on the run from a Dalek time machine. He stowed away on the TARDIS not knowing it was capable of time travel. He has a strong attachment to his stuffed panda Hi-Fi. Steven's first appearance in the final episodes of The Chase explain why he's hiding in the TARDIS. That story also features the departure of long-standing companions Ian and Barbara. This story takes place in the year 1066, and the story assumes you know roughly what happened that year in England. The subject is covered in countless history books, but here are the key points. In January, the King of England, Edward the Confessor, died. There were three claimants to the throne. Harold Godwinson was an Anglo-Saxon who was initially proclaimed king. Harald Hardrada was the king of Norway, often considered to be a Viking, and he invaded from the north. Harald's army was defeated at the battle of Stamford Bridge, and the Viking was killed. After this, Harold Godwinson's army marched south to meet an invasion from the other claimant - William, Duke of Normandy. The two armies fought in the Battle of Hastings. William's forces won, and Harold was killed. The Normans took control of England. They introduced serfdom, treated the Anglo-Saxons as second class citizens, and embroiled England in centuries of conflicts with the French.